The tour introducing our Slices of Life album has probably been one of the greatest undertakings of the band. The slightly complex musical texture was performed for the audience during 2006. The tour began in Hungary in February and it continued during the summer in Europe and the USA. Over 50,000 people saw the band on stage. This programme might have been rehearsed the most. For a two-month period, 27 rehearsals had been realised altogether. We performed the whole album track by track. Only three compositions were played from the album Sheafs Are Dancing a guitar piece from the first Djabe album, and the angklung of course. Wonderful memories are preserved from Hungary, Italy, Rochester, Prague, Klaipeda and several other concert locations. Carefully selected recordings, videos and photos of the tour are included on the double CD and DVD released in 2007 entitled Message from the Road, which features the entire set of the concert tour. 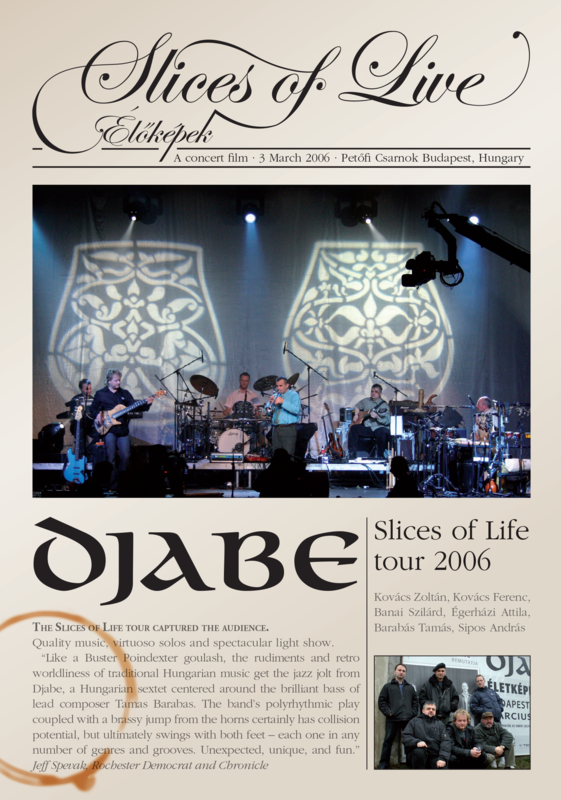 Therefore, present publication features solely the concert held in Budapest on 3rd March, 2006 at the Petőfi Concert Hall, because the Message from the Road does not contain any recordings from this show. We reserved the Budapest recordings for this separate DVD only. According to the original plans this DVD should have come out for Christmas 2007. However, the death of András Sipos postponed work on it and was finished completely in 2012 although the editing of the video recordings had begun as early as 2006. Now, seeing it at such a distance of time, this concert might be even more exciting. It has matured with time like some good wine. The video recording was originally intended for 16:9 format but it was filmed with 4:3 video cameras. While editing the recordings I decided not to mask the screen to fit a 16:9 aspect ratio. Several interesting details would have got lost. However, the video can be enjoyed by zooming in. Therefore, this concert comes with two different aspect ratios. Those who wish to see all the details should watch it in 4:3 format, the ideal one on an older kind of TV set. Those with TVs in 16:9 format and would like the film to fit the screen should zoom in to get the originally intended ratio.